A web-based project management software solution for a company that works in the construction industry. 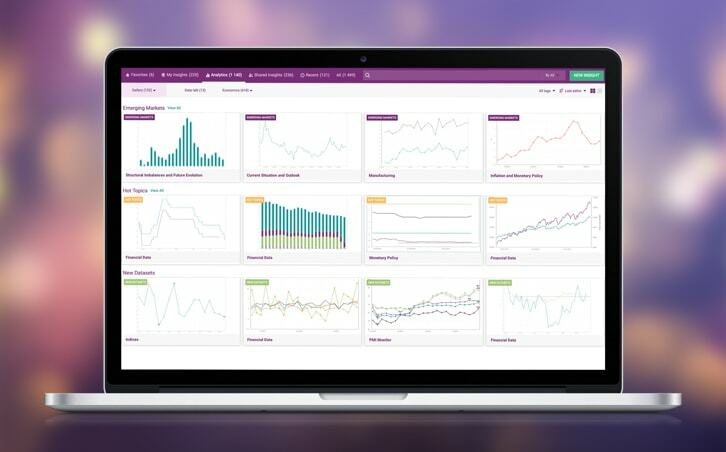 This management app provides a set of tools allowing to monitor the state of the current projects and assign employees to particular tasks. The building and construction industry involves a vast number of employees with different specializations who can be distributed across many different projects at various stages of completion. Within this already complex picture, the tasks assigned to different specialists may themselves have complex dependencies. 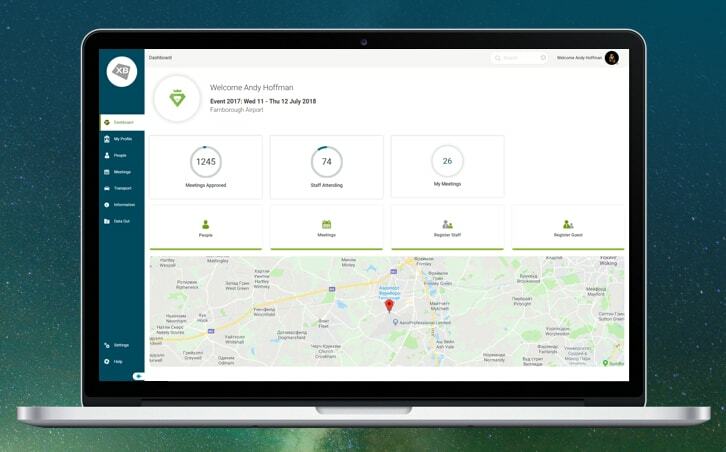 Our development team was asked to create the frontend of online management software that will enable monitoring projects for a company that works in the construction industry. The app should allow users to check the percentage of completion of all current activities. The staff management functionality should enable managers to assign staff members to particular tasks and monitor their progress. To make monitoring and management easier, the software should allow users to split the construction process into a series of subtasks. The list of projects allows users to review and create new projects. 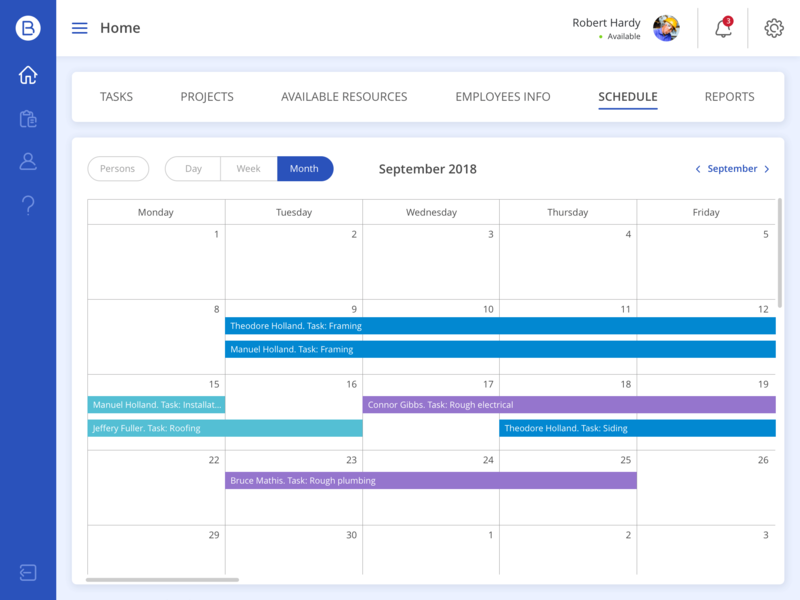 The table contains the start and end dates of all assignments, and it also allows users to set the approximate number of working hours needed to complete the project. The list of resources lets users review and edit company employee data. The list displays such info as employee’s name, specialty, the number of active projects, hourly rate, and more. 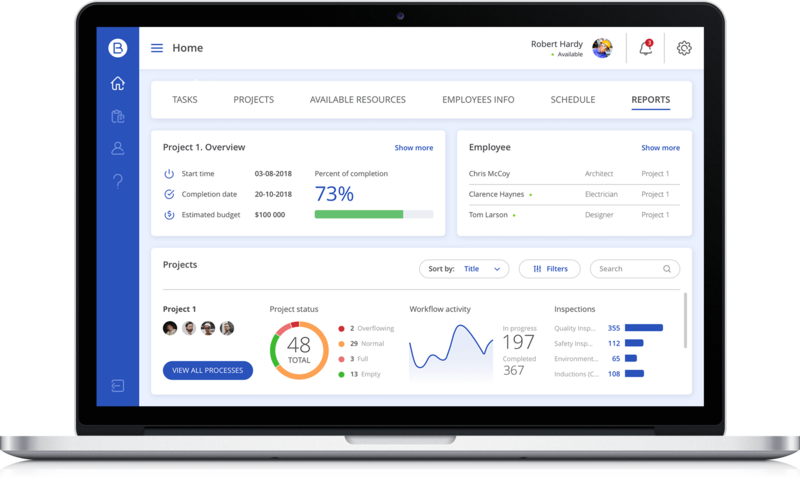 Company managers can use this software to review all specialists that are assigned to a particular project which means they can allocate human resources more efficiently. The management software allows users to define the relationships between the available assignments and their interdependence. The list of available human resources simplifies the assignment of staff members to particular projects, which is pretty useful for the given industry. For example, a handyperson can’t start doing the work before the architect has finished with planning. The complexity of project management can increase many times if you have to handle multiple projects located in different cities and states. The software provides info on all current project and available employees in an easy-to-read way. Besides monitoring the progress of work, managers also have access to info that allows them to make estimations and plan ahead. The resource calendar allows users to review tasks assigned to a particular staff member. Our developers used dhtmlxScheduler to create the Month View for the calendar. The project view contains a Gantt chart based on dhtmlxGantt. It provides a visual representation of a particular project. Users can select one of the available projects to see the assignments it consists of, check or change the percentage of their completion, and create or edit the new ones. 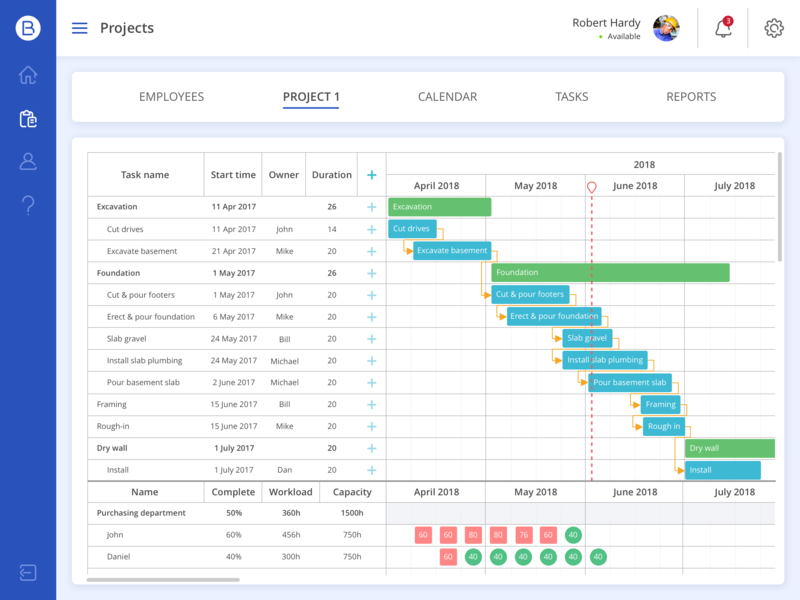 Besides the Gantt chart, this software provides a resource view that helps to estimate the workload of each participant of the project. A company from the construction industry with a large staff team and branches in many European countries.